Dive into your ¡Adelante! experience early by taking a summer math course (only open to students who place into MAT 105-College Algebra). Prepare to excel in college in a FREE four-day summer program that will develop your leadership skills, connect you with classmates and professors, and give you a first-hand look at your new home at John Jay! 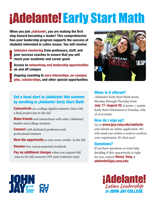 Enroll in an ¡Adelante! Latina/o Studies (LLS 100) First Year Seminar course at your Academic Advisement session and get started on your leadership journey in the fall. Click here to apply online. 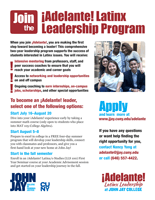 If you have any questions about the Adelante program, please contact Nancy Yang at nyang@jjay.cuny.edu.